Pack your bags and grab your passport! Mickey, Minnie, Donald Duck, Goofy and the gang go on a trip of a lifetime in Mickey Mouse Clubhouse: Around the Clubhouse World on DVD May 20th! Explore France, Italy, China and more in one of their greatest global adventures featuring over two hours of song-filled fun. The DVD is value packed with four additional episodes and a FREE passport activity book for any young explorer! Synopsis: Pack your bags and grab your passport. 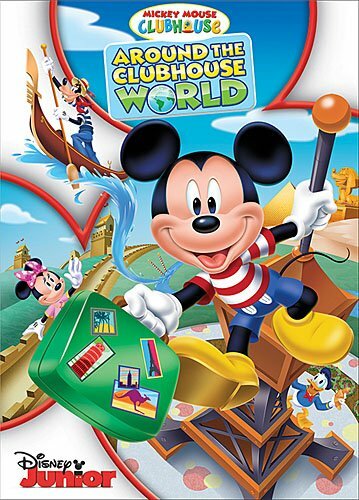 Join Mickey, Minnie and pals on a whirlwind trip Around The Clubhouse World! Climb the Eiffel Tower in France and say "bonjour" to Mademoiselle Daisy and Monsieur Donald Duck. Then, rescue Gondolier Goofy when he goes adrift in Italy's Grand Canal; solve the mysterious riddle of Pharaoh Pete's pyramid in Egypt, and meet a dancing dragon at the Great Wall of China. With your help - and the right Mouseketools - your Clubhouse friends can get their special passport stamped at each wonderful location. Featuring over two hours of song-filled fun, including four additional episodes, this global adventure proves it's a small world after all!